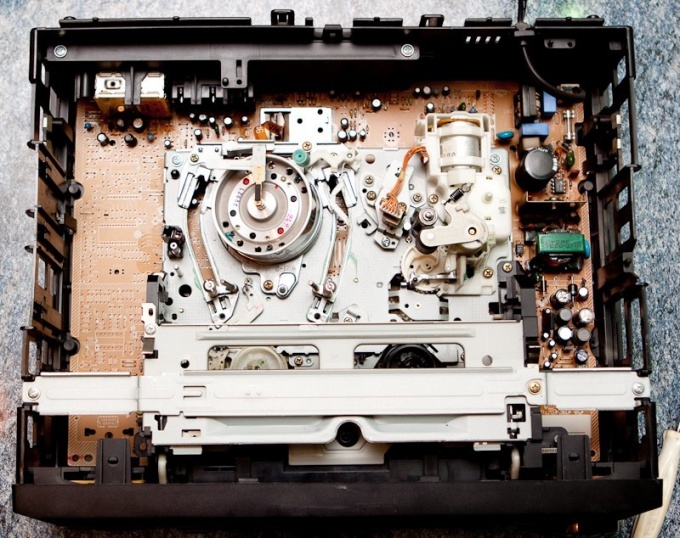 There are several ways self cleaning heads of VCR. This can be done using a special video, intended for cleaning, and with the help of a tampon soaked in alcohol. The first method is to use cleaning tapes. Cleaning to disassemble the device it is not necessary – this is the advantage of this method. Insert the cleaning cassette into the VCR and start it. Wait for the moment until she's lost from beginning to end. You should not use the same tape again. In this case all collected it the dirt will once again be on the heads of the VCR. Also, before using a cleaning video tapes it is recommended to read the instructions for its use to prevent other errors. If a cleaning tape doesn't help, try the second method. It consists of manual cleaning heads of VCR. To do this you need a small stick, rag or cotton cloth and alcohol. Prepare all materials before beginning work. Remove the VCR top cover. Do this carefully so as not to damage the chip device. Inside you will see the drum videografie. Next, take the prepared stick and wrap it in a cloth or cambric cloth. Soak it in alcohol (in a pinch use a Cologne). After this a neat way to wipe the surface of the heads of the VCR. Don't put pressure on them, clean them slow translational motions. Do not hurry, so as not to damage anything inside the unit, including the head. After that, prepare another swab, wound on a stick a rag. Do not soak it in alcohol and leave it dry and gently wipe the head. Do not click on them, otherwise you can damage them. After the procedure without closing the top cover, insert an ordinary VCR cassette video and play it. If you properly cleaned the heads, the image quality is good – you can tighten the lid. If not, repeat the cleaning procedure again.